"What is an Indian narrative? Can the "realness" of data be explored as a fictional space? If I map my indigenous female body, is it now my own?" 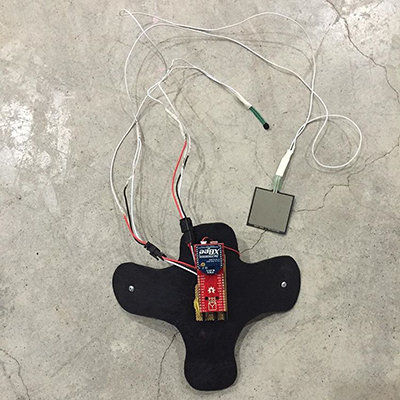 Wireless gyroscopes mounted to carbon fiber wearables. Projected position and temperature data on the wall. "The piece takes my body through an environmental simulation of the Oglala Lakota comsologyscape, as I shoulder the burden of 4 female Lakota characters who have shaped space/time. The piece includes 12 sculptures, animation, sound, video, carbon fiber, clothing, and movement, developed from an obsessive hyper-structure derived from “bad” source books that attempt to qualify Oglala religion into a simplified chart. This piece explores the relationship between my body and the entanglement between lies, fiction, oral history, mythology, ethnography, and Lakota religion." Performed at The Banff Centre on February 6th, 2016. Wireless force touch sensors control a multimedia performance. USGS elevation data rendered in Cinema 4D. Arduino Fio FSR midi interface controls Ableton Live and Resolume Arena.